Carter is a Licensed Clinical Social Worker who received her BA from Davidson College and her Masters in Clinical Social Work from Smith College in 2002. 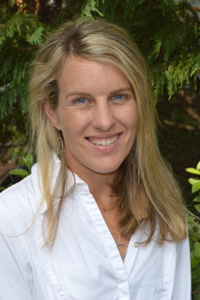 After completing internships at Duke University’s High-Risk OB/GYN clinic and the University of Virginia’s Counseling and Psychological Services Center she spent five years working with adolescents and their families at boarding schools and charter schools in the Northeast. She enjoys helping patients with a variety of issues, but her main clinical interest include adjustment/transitional problems, relationship building, mood disorders, and issues related to women’s health and reproduction. Her therapeutic approach draws from psychodynamic, interpersonal process, and mindfulness theories. When Carter and her husband aren’t chasing after their two children, she can be found running with her dog, Divot, or chasing after a tennis ball. She also loves to read if ever given the chance to sit down.